Ambassador for the World Owl Trust's owl conservation efforts, Georgie the Barn Owl was an undoubted star. He flew in the Trust's "Meet The Birds" programs on the Muncaster Castle lawn in England for over a million people between 1990 and his passing in 2003 at age 13. 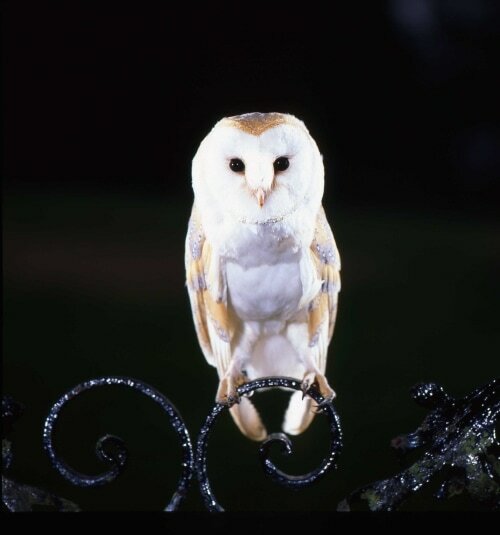 After capturing the audience's attention with his beauty and quirky character, the portal was opened to educate them about the precipitous decline of his species in the UK and the Trust's efforts to help endangered owls in the UK and around the globe. He also appeared at hundreds of lectures and television appearances with his human, Trust founder and 2007 Champion of Owls award winner Tony Warburton. Georgie's fame and beauty culminated in his face adorning Britain's first postage stamp of the new Millennium. Everyone fell under the spell of his presence and when in London for the presentation of an award to Muncaster Castle, Georgie stole the show even in the company of some of the Harry Potter cast! The close relationship between Georgie and Tony allowed the study of the aging process, housing, nest box and dietary preferences, reaction to various drugs, and many other aspects of Barn Owl biology which have been very helpful in the Trust's rehabilitation work. "Georgie really was a very special bird and everyone loved him, especially me," said Tony Warburton in Georgie's obituary. "It's as if someone has turned out a bright light, and things will never be quite the same without him. One thing is for certain, he'll never be forgotten." Especially now, since his work will be remembered in the World Owl Hall of Fame, as he so well deserves. By far the youngest Champion of Owls Award winner to date is Dr. James R. Duncan of Winnipeg, Canada. Even though his hair has yet to turn white, he has still made an impressive mark on the world of owls. Jim is an authority on Great Gray Owls, having studied them since 1984, and he has also been involved in studies on 11 other species of owls. He has served on the graduate committees of seven students studying owls and helped organize three international owl conferences. How's that for a start to his resume! He also knows how to inspire and involve others in owl research. Together with his wife Patsy, he developed and coordinates the Manitoba nocturnal owl surveys which have involved over 600 volunteers since 1991. "Other people pick up on his spirit…he's an inspiration," says Dr. Robert W. Nero, Retired Senior Ecologist for Manitoba Conservation. Education is also a familiar realm for Jim. Besides presenting live owl programs to school children, he authored the book "Owls of the World: Their Lives, Behavior and Survival". Several film crews and various authors of owl books and CDs have Jim to thank for lending his expertise to their work. 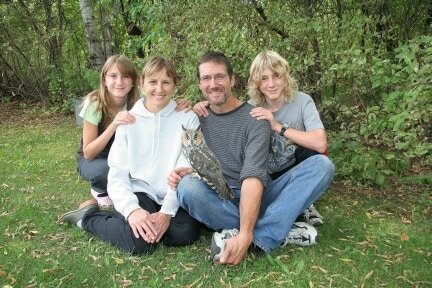 As the manager of Manitoba Conservation's Biodiversity Conservation Section, Jim has had a wide impact on the conservation of owls and their habitat across Canada. He's helped to create management and recovery programs for seven at-risk owl species. This compassionate man also helps individual owls, not as a formal rehabilitator, but in transporting owls to and from rehabilitators, replacing young owls in nests, and more. And since he's not even close to retirement, the owls of the world can only expect more good to come from this true champion of owls. Nearly everyone is familiar with owl pellets, but Gary Duke is the man we have to thank for understanding how it all works. His pioneering research on owl digestion with Great Horned Owls still stands as the classic and most comprehensive work in the field. Serving as the Director of the Avian Research Center of the University of Minnesota, he collaborated with researchers across the USA and internationally, resulting in a wide array of publications and presentations. He authored more than 40 publications on raptors, most being about owls. "Owls were his passion, his favorite bird," says his widow, Maryann Duke. "He especially admired the Great Horned Owl because he thought they were so brave and tough." Gary is perhaps most well-known for co-founding the The Raptor Center in St. Paul in 1974 and serving as Co-Director until 1986. The Raptor Center specializes in the medical care, rehabilitation, and conservation of eagles, hawks, owls, and falcons, currently treating about 800 birds a year. It has grown into an internationally known program, providing training in raptor medicine and surgery for veterinarians around the world and identifying emerging issues related to raptor health and populations. The Raptor Center's education program has grown to reach 240,000 people annually, serving to strengthen the bond between humans and birds. Gary passed away in 2006 at age 68. He handled his battle with Alzheimer's "with typical grace and humor and was a gentleman to the end. Our daughters and I are very proud of him," says Maryann. He resided in Shoreview, Minnesota.